Southern barbecue is the Blackbird's new focus as of mid-April 2018. If you show up at Spokane restaurant the Blackbird Tavern + Kitchen in the next week or so, you’ll find the doors locked, and no service. Fear not, though, fellow foodies: The downtown restaurant just north of the Spokane River is definitely not going anywhere. After a projected reopening on Monday, April 16, however, the service format and style of the restaurant’s menu will have a completely new theme: Southern barbecue. Some changes to the interior, and a new order-up-front service system, are also part of the shift. Owner Patrick McPherson (who also owns Manito Tap House on the South Hill) tells the Inlander that this change of concept was part of the plan all along when he opened the restaurant back in 2015. “Before the Blackbird, we talked about changing the concept every few years instead of building another restaurant,” he says. The restaurant’s name won’t change, but the new menu debuting with its reopening centers around a hearty selection of Texas-style smokehouse proteins: brisket, pulled pork, ribs, hot links, chicken and, for the vegetarians and vegans, pulled, smoked jackfruit. These base proteins can be ordered one of four ways: as a plate with two sides, bread and pickles ($14-$24); sandwiches with one side ($12.50-$15); tacos with smoked sour cream and pickled red onions ($2.50-$3 each), or “just the meat,” priced by the pound ($13.50-$24). Chef Molly Patrick has also created a complementing assortment of appetizers, a new kids’ menu and ala carte sides. There are also three salads, including two previously served at the restaurant; the tomato garden and smoked salmon. For many barbecue lovers, no meal would be complete without a hefy slathering of sauce. Patrick’s lineup of house-made sauces, available in caddies at each table, are as follows: Carolina mustard vinegar, Texas-style, sweet heat, Kansas City-style, hot Kansas City-style and Alabama white. Sides, which come with sandwiches and plates, are baked beans, vinegar coleslaw, mac and cheese, potato salad and black-eyed pea salad. Decor won't change, though the dining room's ultra high-backed booth seating is being lowered to create a more communal atmosphere. As part of the refresh, the restaurant's entrance will also move from facing Washington Street to a door on its patio, located on the south side of the building, which offers easier access from the restaurant's parking lot. When customers step inside this new entrance, they'll now place orders at a cashier stand or a self-serve kiosk. McPherson says once orders are placed, though, table service will resume, with servers bringing out customers' food, and checking back with them through the rest of their stay. Orders for beer, wine and cocktails will also be taken at tables, instead of during that initial ordering stage. 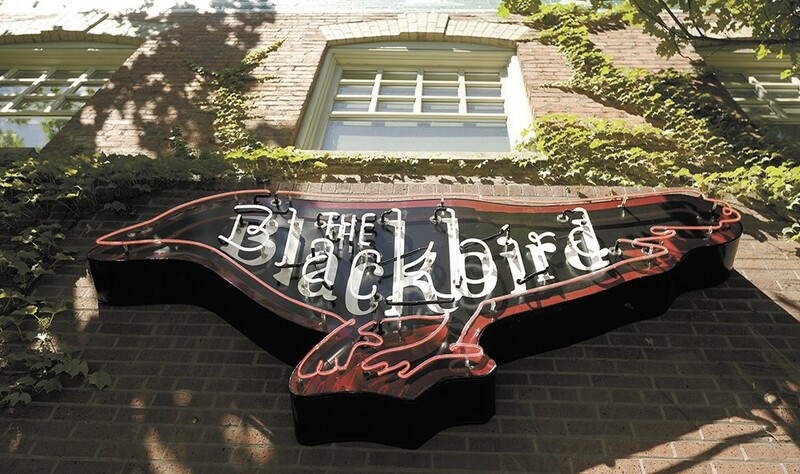 The Blackbird's craft cocktail program will shift to serve drinks that better complement the new barbecue menu, but its massive selection of craft beer on draft and in bottles won't change. Brunch service on the weekends will resume, too, but with a slight shift in the menu. Most noticeably, the switch from Southern-inspired gastropub fare to entirely barbecue will mean that when the restaurant runs out of, say, brisket for the day, that's it. Meats will be smoked daily, Patrick says, which is requiring the restaurant to add a graveyard shift to smoke meats for each day's service. "The philosophy is still the same — scratch-made, fresh, local and fun, we're just doing barbecue," Patrick notes.